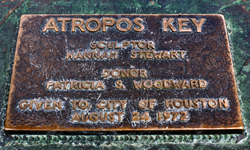 Prominently positioned at the top of the seating area at Miller Outdoor Theatre, a place known to generations of Houstonians simply as the Hill, Atropos Key is a cast bronze sculpture atop a concrete base faced with black slate. It was created in 1972 by Hannah Holliday Stewart and was presented to the City of Houston by Patricia S. Woodward. A dedication ceremony took place on August 24, 1972. 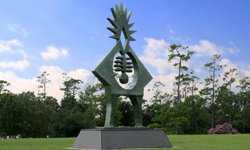 In 2009, the Houston Arts Alliance removed the sculpture, had it professionally cleaned and restored, and replaced it in its location on the Hill. The title of the piece refers to one of the Fates, the daughters of Zeus in Roman mythology. Along with her sisters, Atropos was responsible for the destiny of humans. Stewart studied art at the Cranbrook Academy of Art and taught at the University of St. Thomas. She worked with the Houston Woman’s Caucus for Art and had a reputation as a major force in the art world at a time when sculpture and the marketing of art were dominated by men. She died in New Mexico in 2010.